Student crisis contact information is managed through Sage. Go to Sage, and log in using your Brandeis username and password. Click on Personal Information then click "Crisis/Weather Contact Info." 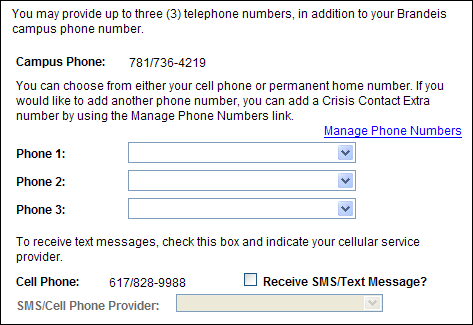 In the first box on the Crisis and Weather Contact Numbers and Email Addresses page, use the drop-down menus labeled Phone 1, Phone 2 and Phone 3 to select up to three personal phone numbers for the university to use to send voice messages during a crisis or severe weather event. Each menu allows you to select from a list of phone numbers that you have already saved in your personal portfolio on SAGE. To add a new personal phone number or change one of the phone numbers that you have already saved, click Manage Phone Numbers. Detailed instructions are available. At the bottom of this box, you can activate your cell phone to receive text messages from Brandeis during a crisis or severe weather event. An already stored cell phone number in SAGE will automatically appear. If you haven't stored a cell phone number, click on Manage Phone Numbers to add a cell phone number to your personal portfolio. Click on the Receive SMS/Text Message? checkbox to activate your cell phone number. From the SMS/Cell Phone Provider menu, select the name of your cell phone service provider. Detailed instructions are available. Below the line, use the drop-down menu labeled Additional to select a personal email address for the university to use when sending you email messages during a crisis or severe weather event. This menu allows you to select from a list of email addresses that you have already saved in your personal portfolio on SAGE. To add a new personal email address or change one of the addresses that you have already saved, click on Manage Email Addresses. Detailed instructions are available. Click on Confirm and then Submit. If you wish not to be contacted by Brandeis during a crisis or severe weather event except via your campus phone and Brandeis email address, please review our detailed instructions.